Synopsis: Rowan and Citra take opposite stances on the morality of the Scythedom, putting them at odds, in the second novel of the chilling New York Times bestselling series from Neal Shusterman, author of the Unwind dystology. 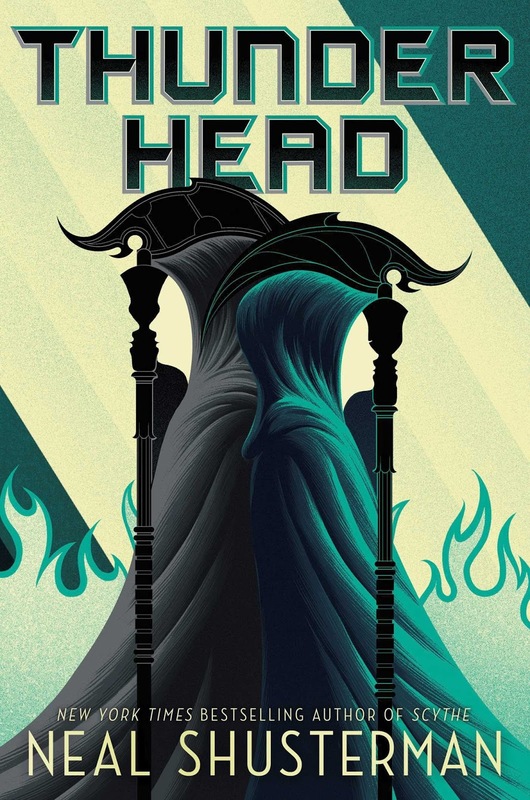 It's not often that a second book in a series enraptures me more than a first, but that's what has happened with Thunderhead by Neal Shusterman. I liked Scythe well enough, it was well-written with a really interesting concept, and some great twists and turns. But this sequel takes it to another level. Just a quick anecdote... I frequently read in my car on my lunch breaks, and more often than not, I'll end up falling asleep for a little mid-day nap. But this book got me in such a grip, that I stopped falling asleep! Thunderhead moves at a much quicker pace than Scythe, which is a good thing. I mean have you ever complained about a book moving at a quick pace? Yeah yeah, sometimes people can talk about how they enjoyed a book's slow pace with its flowery words and all that, but that type of book makes me fall asleep. Here, I wanted to know what was going to happen next. Shusterman does a great job of setting up a lot of different, seemingly unconnected plots, only to have them all come back and snap together like the pieces of a puzzle. What's most interesting, and perhaps most disturbing as well, about this sequel is in the between chapter interludes. In the first book, these interludes were excerpts from Scythe journals, but here they are all what the Thunderhead itself is thinking. And feeling? Good question, that, because one of the main things this book is dealing with is what it means to have an artificial intelligence run the world while also contemplating its own existence, which is very much something that feels on the horizon in the real world. It was also nice to see a book not so focused on romance. Don't get me wrong, I love me a romance just like the next person, but it wasn't needed here. There's enough other drama going on that really focusing on a romance between Citra and Rowan wouldn't have felt right for the tone. Some readers may miss their interactions, because they are fewer even than in Scythe, but for me it just made the moments when they are near each other that much more meaningful. This book also does something that can be super annoying, but really worked here - it introduced a new main character that wasn't even mentioned nor hinted at in the first book. I was ready to really dislike this new character, but he grew on me quickly, and because he is connected to what's going on with the Thunderhead, it was also super intriguing. I also was really worried that too much focus was going to be on him at a certain point in his story, but instead the author knew to pull back on his story at that point. The ending is such a cliffhanger, and I can't wait to read the next one. Not sure if it's purely a trilogy or what, but I'm here for it either way. Definitely do if you're intrigued! I can't wait for the third one.... which is going to be awhile! !